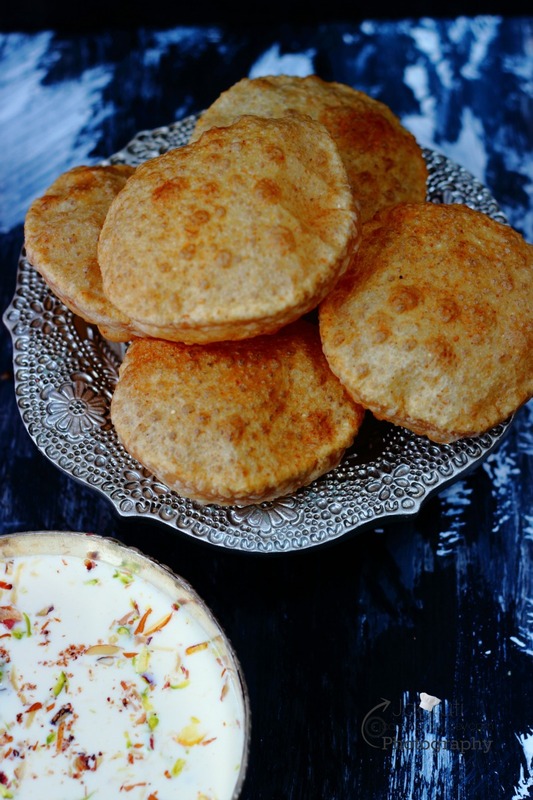 they will narrate their love for this a very rich Gujarati dessert made of Full fat milk and rice not only looking so divine and luxurious, but also in taste too. Doodh Paak is mostly prepared during festive season in Gujarati Household. 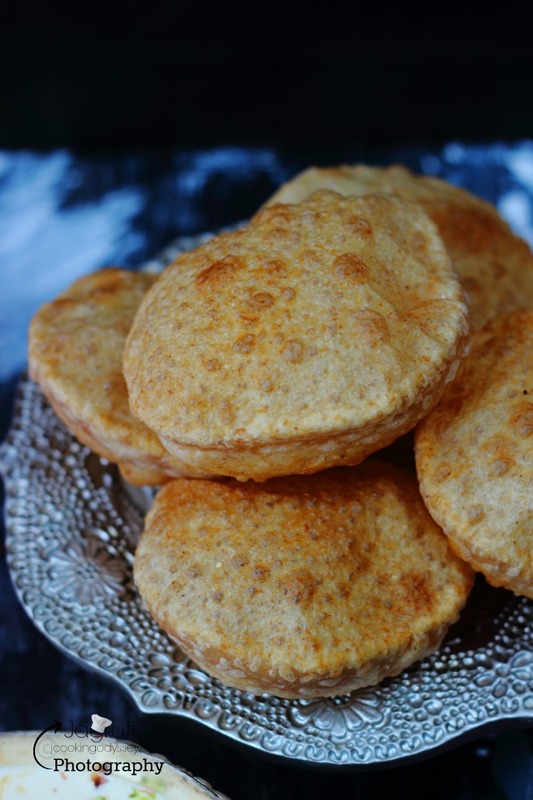 This delicious and sinful Gujarati dessert is best served with Puri, Bhajiya ( Pakora ). Since I posted my recipe Kesar, Pista , Nariyal Doodh Paak Ladoo, many of you asked me about Doodh paak recipe, few asked me is it kheer ? No it's not ! How ? Kheer and Doodh Paak looks similar, Ingredients are same, method is little different. Kheer is very creamy and thick. In the method of making kheer as soon as milk starts boiling, we add rice and cooked till everything until rice is almost mushy. In kheer recipe saffron can be added. So what is Doodh Paak ? Doodh Paak translates 'Cooked Milk'. In Doodh Paak recipe, it is very important that you boil milk first and milk should be concentrated and approximately 60% of water content has to be evaporated and it should look like cream colour evaporated milk but should not become Rabdi or basundi. Ratio of milk and rice should be 1 litre milk and 1 tablespoon rice. In doodh paak rice is only added after milk is cooked properly. And please do not add saffron. 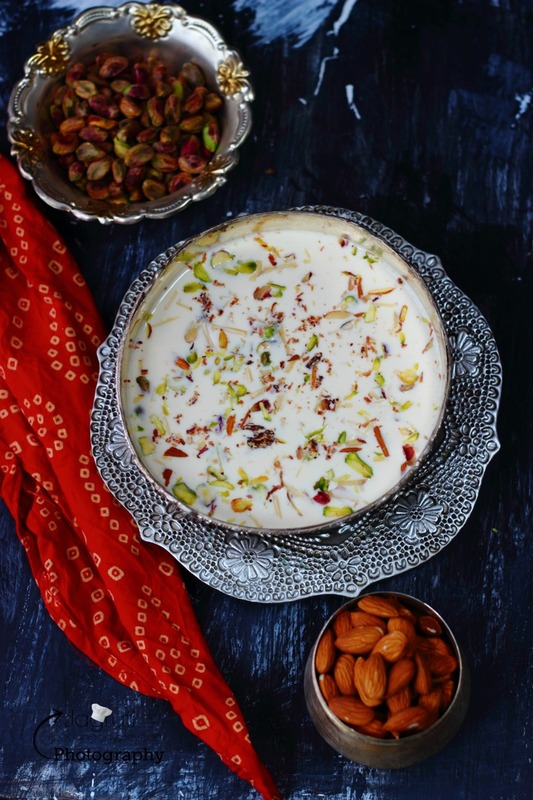 Doodh paak should only be garnished with almonds and pistachio nuts. Why I am so sure about this recipe, it's not my confidence but the person who taught me, she was the confident one, and Doodh paak made by her was the most popular recipe in the entire block where I grew up and she would swear on this recipe. No, it wasn't my Mum ! 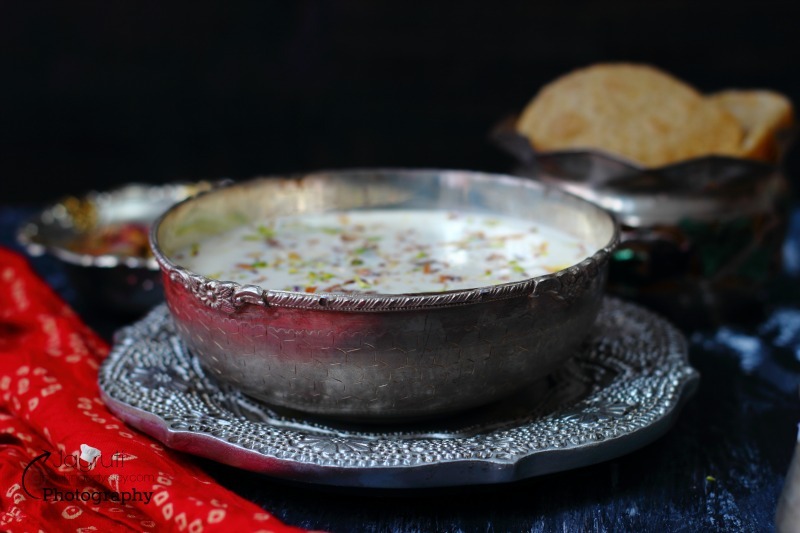 In India, one of our next door neighbour lady, fondly we've always called her' Masi ' (aunt) who would make Doodh Paak on every Raksha Bandhan and she would make sure that one big bowl of Doodh Paak reaches to our house, mostly in our house mum used to prepare Kheer or Shrikhand on Raksha Bandhan. Not only me but her BIL was also great fan of her Doodh Paak too. He would easily gulp it down 3-4 bowl at a time At that time I was big fan of her cooking, but only after I got married I noted down few recipes from her like Handvo, Methi Thepla,Sukhdi and Doodh Paak ! Recently I had an opportunity to prepare Doodh Paak as we had small religious ceremony, for Prasad I prepared Potato and Chick Pea curry (without onion and garlic ), Coconut and Almond rice, Puri and Doodh Paak ! Mix ghee into soaked rice and leave it aside. Pour milk in the pan and bring it to boil, keep heat on medium. Continuously keep stirring the milk, keep an eye the milk, it should not stick to the bottom of the pan or do not allow to boil over or spill out, otherwise the smell of burnt milk will spoil your entire dish. Keep stirring slowly milk for 30-40 minutes. Now add rice and continuous cook the doodh paak. Keep mixing and cook on a medium flame for another 10-12 minutes until sugar dissolves properly. Add cardamom and nutmeg powder. Sprinkle slivered almonds and Pistachio. Best served with Poori or Puri ..recipe coming next ! Such beautiful pictures!..I enjoyed all the shots! This looks delicious with such lovely flavours! I look forward to trying this! Any sweet made with diary is my favourite! Love it. I also love your garnish in the dish. It is so vibrant and tempting. I do like milk based sweets, this looks tasty. I make similar one, but slightly different. Looks delicious and festive too:) So many desserts out there to celebrate our festival:) Nice to know one more. I wish I could grab a bowl of doodh Pak from my screen. Beautiful pics and very well explained. Wonderful share. 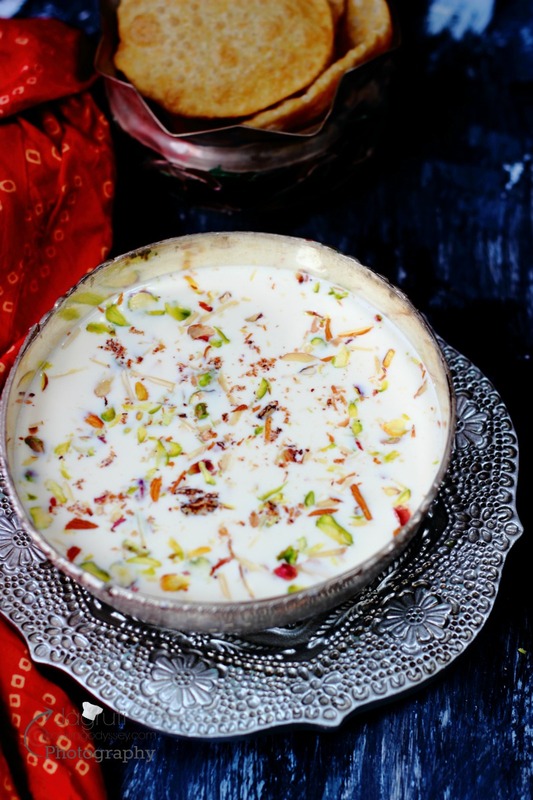 This is so beautiful looking delicious kheer/ dessert. Love to add new recipes during festival season and this sure hits all the right spots. your pictures are always an eye candy. Great share !! Aaah the sight is just enough and I am drooling and reading your post my tummy is rumbling want to grab the puri and doodh pak and enjoy it to its core, loved the way you have explained the difference between kheer and doodh pak finally got to know the difference between them, lovely recipe as usual. Wow. Such a good explanation. I always think both Kheer and Doodh Paak are same with little difference. But now I understood very clearly. Thank you so much Jagruti for the wonderful description and picture. 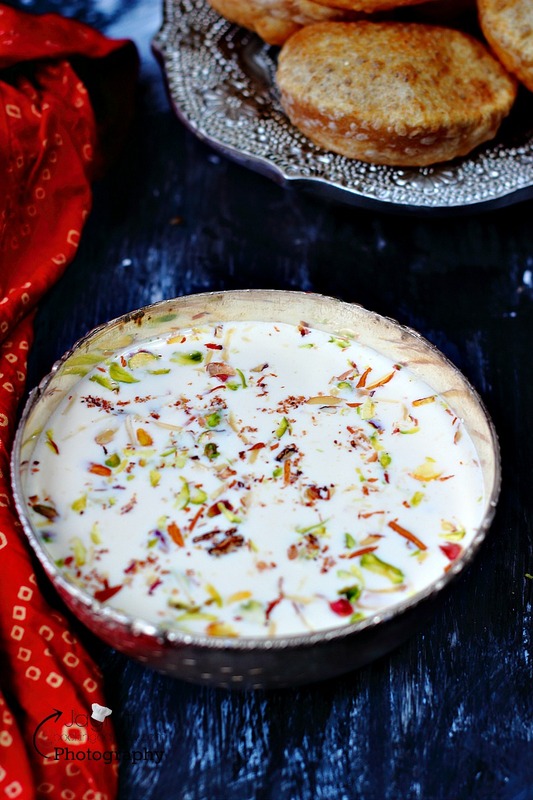 How delightful this doodh paak looks, i can finish that bowl just like that. Lovely description Jags. And that serving bowl is simply ultimate. Oh my!! deliciousness behold. You have got the complete package, puffy poori, creamy doodh pak, yumm. I love the note on the difference from the Kheer. Rice pudding looks delicious and clicks are really awesome. Thanks for sharing. My eyes are in poori..that looks so yummy. Rice puding with poori will make a perfect combo. Great that you differentiated between kheer and doodhpak. Even I had that confusion. And yes in kheer ratio is given correct, looking delicious. Love these utensils beautiful. We love these milk based sweets at home. 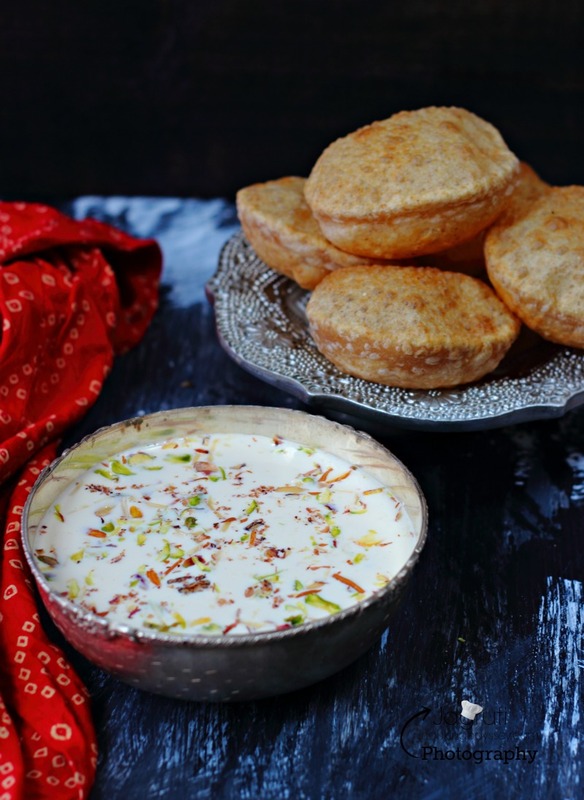 Doodh paak looks so delicious and with puri it's a treat.